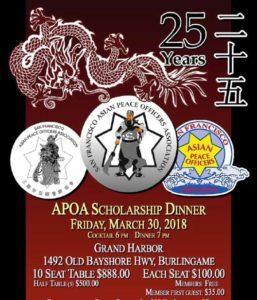 The Annual Scholarship Banquet will be held on Friday March 30, 2018 at Grand Harbor Restaurant in Burlingame. More information to follow so save the date. This entry was posted in Uncategorized on January 25, 2018 by Mike. The Chinese New Year Parade will be Saturday, Feb 24, 2018. We will be marching in the parade. We welcome all members to march that night. If any member is interested in marching, please email me so that we can get a headcount. Members families are also invited to march with us as well. There will be a dinner following the parade for all members and their families. We are in the process of securing parking and transportation to and from the parade. We will have more information later on, and will email the info out to all. If you are currently working regular that day and wish to be detailed, please email us ASAP so that we can submit the memo for all members that wish to be detailed. The deadline to submit to us to be detailed will be no later than Feb 7, 2018. If you have any questions, please email me. The February membership meeting will be held on Monday, February 12th 1800hours. The meeting will be held at Taraval Station’s community room. If you have any questions, please email me. Take care all.